Alvaro Ras Born in Buenos Aires, studied Cinematography and worked in advertisement cinema and television. Influenced and tailored at a very young age by the old fashioned school of photography of long hours in the dark room. The light of his work is expressed in the realism of his art, and thus the obsession of telling stories through images as a consequence of his background in cinema. He started very young with the old-fashioned school photography of long hours in the dark room. Which express in the lights of his work and at the same time the obsession to tell stories with the image as a consequence of his background in cinema. “ That thin line that divides fantasy from reality; classic photography as a realistic document and then the digital art transformed into fantasy” That is the way that the author describes his work, where he looks for this new aesthetics that time will find its name. Alvaro´s Ras photography is characterized by achieving a strong message full of imagination and of a distinguished quality All images are made with photos specially taken by the author and then “intervened” in Photoshop, without any drawings, only his own photography. This technique allows to ad aesthetics and information to the work, always telling a surrealistic story fulfilled of magic. The Woman is always present as a muse and icon of our culture, sometimes close to animals, representing nature and origins as a counterpoint. His work is his trademark. We can immediately recognize his extraordinary photography narrating always-another marvelous story. 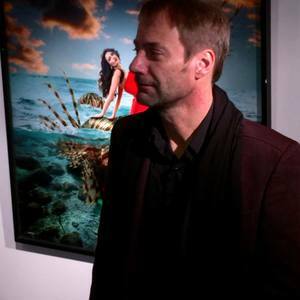 His art is exhibited in different spaces and art galleries in Argentina and outside the country. He has participated during many years with his own space at Buenos Aires Photo Director of EFADA (School of Photography and Digital Art) Director of Estudio Alvaro Ras, fashion and advertisement photography.